In this post I describe my pattern of Git usage. My project (NuGet support for TeamCity) contains two main branches called 'v0.5-bugfix' and 'v0.6-bugfix'. 'v0.5-bugfix' branch is targeted for TeamCity 6.5.x. 'v0.6-bugfix' is targeted for TeamCity 7.0 and contains more features. Main work is done. New feature is implemented in branch 'v0.5-bugfix'. Now it's time to merge it onto v0.6-bugfix. 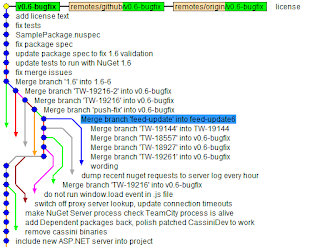 For it I create a branch 'task6' from v0.6-bugfix. Than I merge branch 'task' into 'task6'. That was it. The feature is ready for both branches. It's time to push. Another trick I found useful is to try to create branch from the lowest possible version even if you do not need it. In future that will let you simply merge the feature to older version. This way of updates let's you avoid issues if remote branch has new commits and your local branch has another commits. I do not like rebase because it requires force push (-f) with possible history overwrite if you decide to push it once more after rebase.